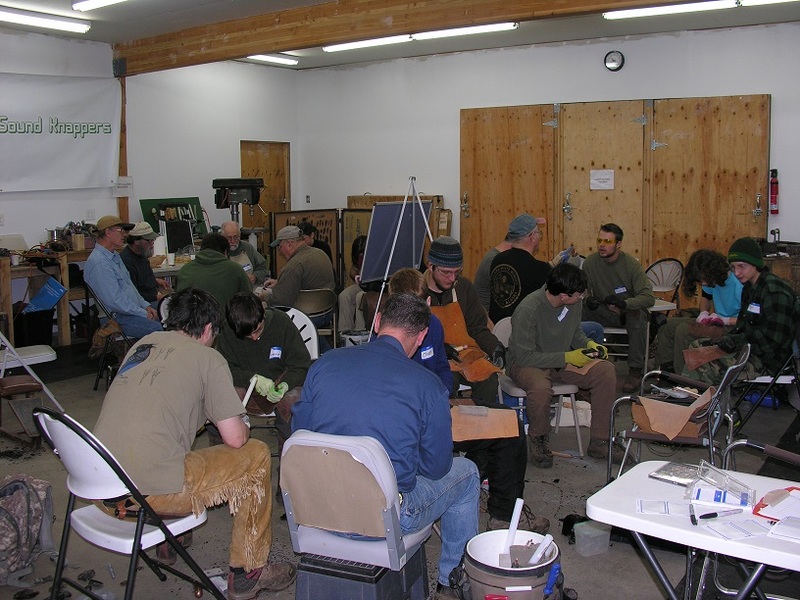 On Saturday, December 14th, 2013, Jim Keffer along with PSK members Joe Higgins, Jim Miller, Jim Smith, Donn Paris and Mick Hill hosted twelve students from the Wilderness Awareness School and six additional 'noobie knappers' for an entire day of flintknapping instruction. Also attending this one day event were several other noobie knappers who came to take advantage of some exceptional instructors. The ages ranged from 14 to 18 for the WAS students and into the 60's for some of the other newbies! All told about twenty-five people, including the instructors, were able to break some rock. The furthest travel award went to Thaddeus 'Tad' Sweet, who drove up from Portland, OR! Like all PSK events, everything provided was free - free instruction, free rock, safety glasses, nitrile-coated gloves, and even a free lunch of bean and beef tostadas! The day was a tremendous success. All of the 'students/noobies' were enthusiastic and highly motivated to learn. And while none of them had any prior experience, virtually all were able to make a decent point by the end of the day! In fact at least a half dozen had the arrowheads they'd made wire-wrapped so that they could make arrowhead necklaces with bone and antler hair pipes and other necklaces making material provided by the host. To say it was a busy day would be a gross understatement. Each instructor had their hands full teach at least three noobies at a time. There wasn't much time out for photos but we did manage a few. 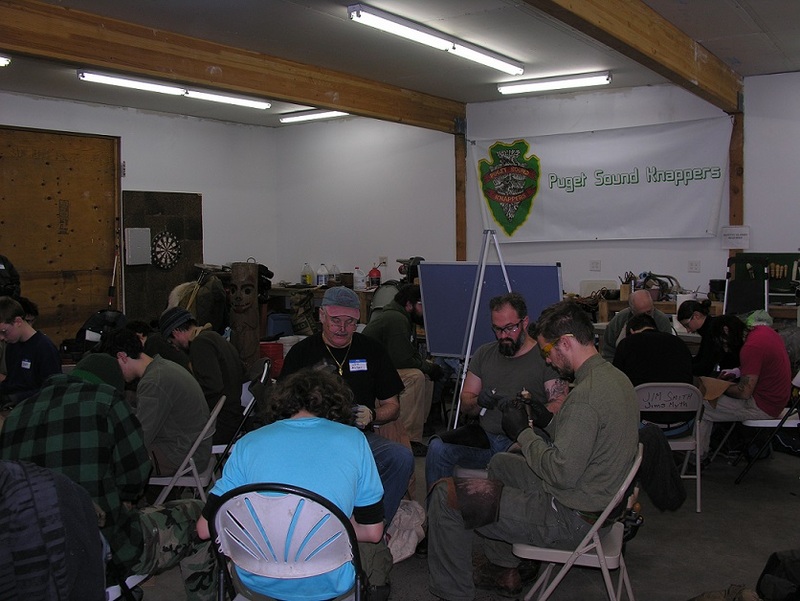 Plus eight of the noobies wanted to continue their association with the Puget Sound Knappers and sign up as new members! Special thanks go to all the instructors who spent an entire Saturday teaching young people the ancient art of flintknapping! First there were some 'admin' topics to cover - safety glasses, outhouse location, coffee and drinks, etc. The students were quite attentative. I don't know if it was the news about outhouse availability, the coffee and donuts or the free lunch announcements that got people excited - but something did! We broke up into small instructional groups - one instructor to 2 - 4 students. The days emphasis was on pressure flaking but a fair amount of time was spent on percussion as well. Students were also able to see and try the techniques of several of the Master Knappers. Jim Miller and his group - thank goodness for the name tags! Douglas 'Grey' Cowan (standing dark shirt), an instructor at the Wilderness Awareness School arranged for the students participation working with Jim Keffer (standing, white hair, blue shirt). Grey has been an occasional attendee at the weekly Ft Knapadonia Knap-in and under the tutelage of Joe Higgins and Jim Keffer is becoming a fine knapper. Seated between the two are Donn Paris and Jim Miller. Donn is not only a longtime flintknapper and PSK member but is also a primitive skills instructor who teaches, among other things, bow and hand drill fire making, bow, atlatl and arrow making, and flintknapping. On Donn's right is reknown flintknappers Jim 'Goldpoint' Miller.